Warning: spoilers for Agents of S.H.I.E.L.D. Season 3 premiere are ahead! If you watched Agents of S.H.I.E.L.D.’s return last night, no doubt you caught the various references to Marvel’s more recent movies, from the Battle of Sokovia (Avengers: Age of Ultron) to Pym Technologies (Ant-Man). However, the Season 3 premiere was also looking to the future by setting into motion events that will play a factor next year in Captain America: Civil War. This is primarily through getting glimpses into not just how the world views people with special abilities, but with how the government is dealing with said individuals. As foreshadowed in the Season 2 finale, the release of Terrigen into the ocean following Jiaying’s failed plan has resulted in Inhumans emerging across the globe. Take Joey Gutierrez (played by Juan Pablo Raba), who was a normal guy living his life until he ingested some fish oil tablets and suddenly found himself turned into a pyrokinetic. Not able to control his powers, he accidentally caused destruction in his neighborhood at the beginning of “Laws of Nature” until Daisy Johnson (previously known as Skye), Mack MacKenzie and Lance Hunter were able to safely extract him. Here’s where things get extra sketchy. Before Joey was saved by the S.H.I.E.L.D. team, he was nearly taken out by mysterious operatives. We find out later these folks are the Advanced Threat Containment Unit, led by Rosalind Price (played by Constance Zimmer). As explained by President Ellis (welcome back to the MCU, William Sadler), this unit is meant to combat the growing number of alien-related events in the United States (and probably the world). Unlike S.H.I.E.L.D., they’re not interested in helping new Inhumans control their new abilities, but are focused on neutralization. In other words, we don’t have to wait until Captain America: Civil War to see the government dealing with superpowered people. It’s happening right now! For most of the MCU, there haven’t been a lot of individuals with special powers, and the most notable ones have been in the Avengers flicks. Now abilities are being awakened across the world. Rather than letting them run around free, the government feels that this situation needs to be contained and controlled. It’s easy to see how all of this will pave the way for Captain America: Civil War next year. Following some kind of collateral damage during an Avengers mission, the world’s various nations will put together a system of accountability that will regulate people's unusual abilities and leave them answerable for their activities. At first it sounded like this would only apply to costumed heroes, but with what’s going on in Agents of S.H.I.E.L.D., it’s likely that normal people with abilities will be targeted, as well. Obviously it’s all one universe and we can’t say much, but we can say that we do have people across the globe who have powers on our show and there would be varying reactions to that. A lot of fear, some excitement, some people wanting to use it for good, some people wanting to use it for evil. So, a lot of those same themes will be addressed on our show. How they tie in is a question mark for all involved, but we would definitely be dealing with some of those same themes. We won’t see this changed status quo explored on the big screen until Captain America: Civil War hits theaters next May, but people watching Agents of S.H.I.E.L.D. will see how Inhumans are being dealt with, and the events over the next nine months will no doubt set the stage for the grand conflict in the Star Spangled Avenger’s third solo outing. It’s a crazy time in the MCU. 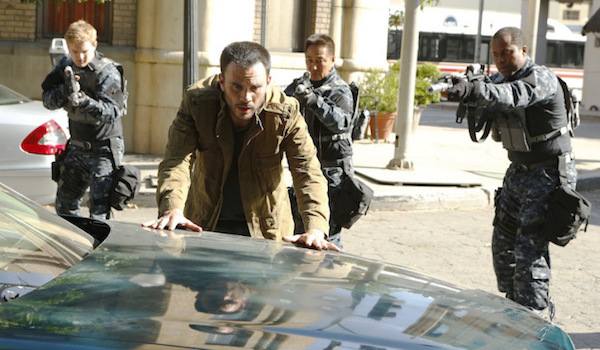 You can catch new episodes of Agents of S.H.I.E.L.D. Tuesdays at 9 p.m. EST on ABC.